The garden of the Bethlehem Natural History museum is divided into sections. Each section is related to the gardens research. One of the sections contains a terrace agriculture setup. Terraced fields can be found throughout the Palestinian Territories. By cutting the hillside into flat terraces, more land can be opened up for cultivation. Many terraces contain Olea europea groves, these are also grazed by goats. The museums terraces are designed to be a “No Dig” set up (That’s no annual digging after you have dug them!). A trench is dug behind the terrace walls and lined with stone. This collects water during the rainy seasons. 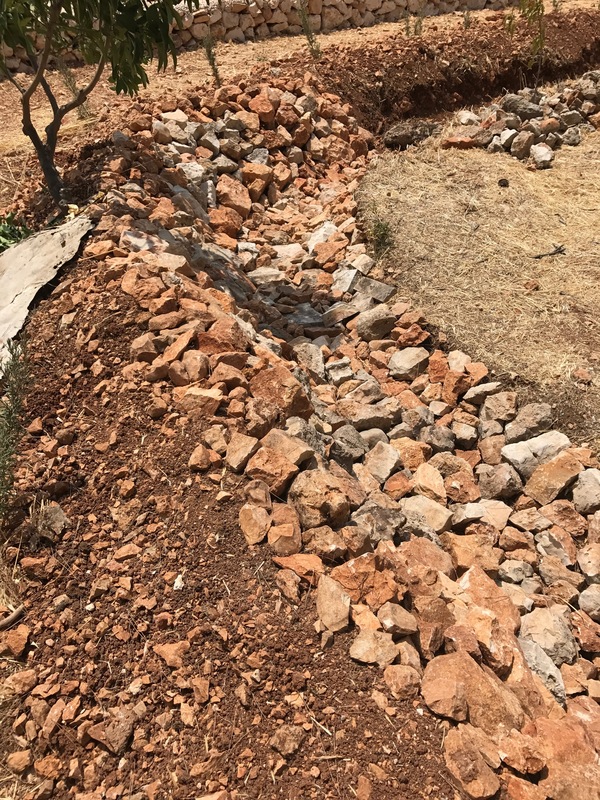 The water fills the trench then soaks slowly into the ground, irrigating the terrace deeply. 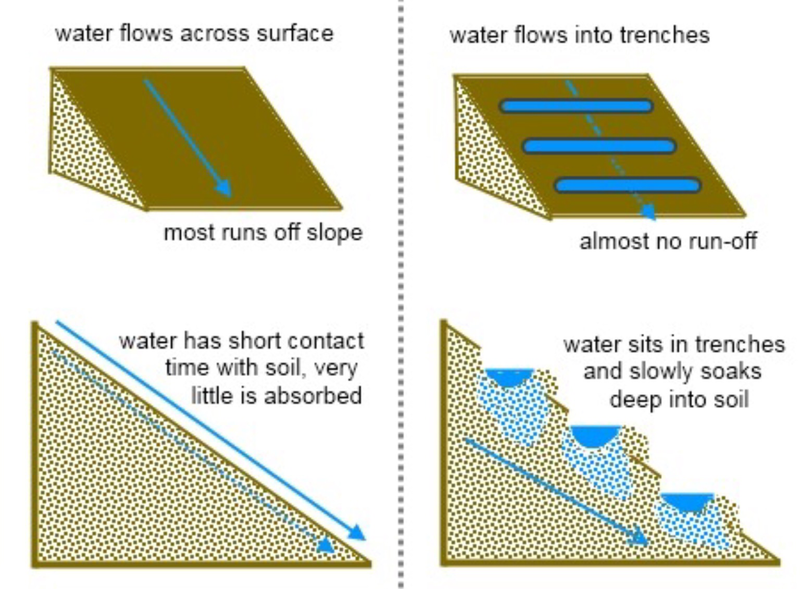 Below I’ve included a diagram showing how the trench collects water and pictures of the trench being constructed. Displaying and teaching traditional agricultural techniques is highly beneficial. In an area where man made resources can be expensive and scarce, traditional methods are very useful. They typically require minimal inputs, of materials found in the local area. The only limit is the number of hours you can spend digging in the heat! Last week my Israeli visa came and shortly thereafter I was on a plane to Ben Gurion Airport. During the past month, the warnings about security and the difficulties of entering the country have been playing on my mind, but, as it turned out, all of my concern’s were needless. It took me less time to get through security than it did when I visited Canada earlier in the year (Who said Canadians were friendly?). Tzvia (The Programs and Educational Coordinator) picked me up at the airport and shortly dropped me at my new flat in Jerusalem – a nice smooth start. Currently, I’m sharing the apartment with Eric, another student who has come here from Australia and is in the last month of his nine month term. When we begin work on Sunday (the working week here is Sunday-Thursday), Eric will start handing over the projects he’s worked on during his time here, and so the cycle of students continues. 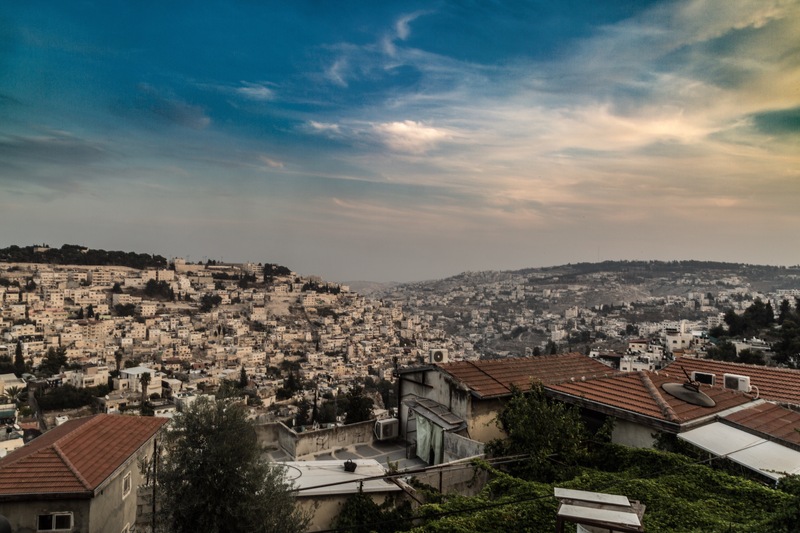 On Friday morning Tzvia, Eric and I went into Jerusalem and they helped me sort out the boring essentials like phone contracts, shopping and public transport – things that are a godsend to have help with in a foreign place. We also got breakfast and I had my first taste of Israeli cuisine. I had a dish called Shukshuka, which is poached eggs in a tomato sauce with chilli and onions – good food that’s defiantly very different to what I would normally eat. Having completed the essentials, Eric and I returned to the flat with the plan of cycling to the old city later for some site seeing. Our apartment is a few kilometres from Old City and it’s a hilly few kilometres at that. It’s also worth noting it’s about 25 degrees here at the moment so the ride was rather uninviting! We made it though in good time. Eric knows his way around the city, so I could just follow him, and on the way he pointed out sites and shared interesting facts, making cycling a nice way to view the city. Seeing the Old City for the first time was incredible; photographs fail to do it justice in terms of its scale. We locked our bikes up near the Jaffa gate and proceeded on foot. The Old City is divided into four sections: Jewish, Christian, Muslim and Armenian. Each section therefore has a totally different feel to it. The Muslim section was definitely the most interesting; the narrow streets lined with market stalls selling everything from spices to knock off gucci feel totally surreal. Walking around here it began to sink in how far from home I am culturally as well as geographically. Many of the sites in the Old City we visited were packed with tourists, understandably so. Sadly this makes them difficult to photograph as people are always in the shot. When we entered the Church of the Redeemer luck was on my side and it was empty. I had time to set up my camera and take a long exposure before anyone else entered the church. Our trip around the Old City only scratched the surface of what there is to see and I hope to return many times during my stay, hopefully when it’s a bit quieter. I was unable to visit Temple Mount as it’s only open to tourists at certain times due to its religious purpose, another treat for another day! 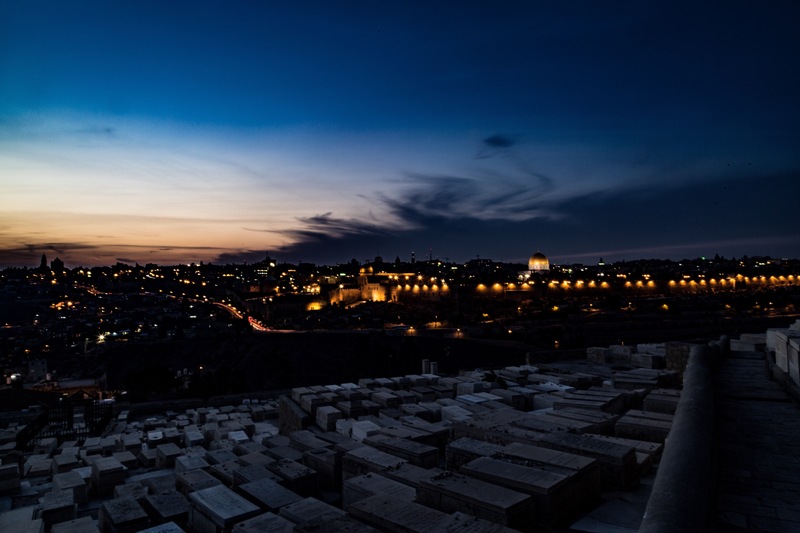 After leaving the Old City we cycled up the Mount of Olives to watch the sun set and grab a few more photos, closing out an interesting and exciting first day. 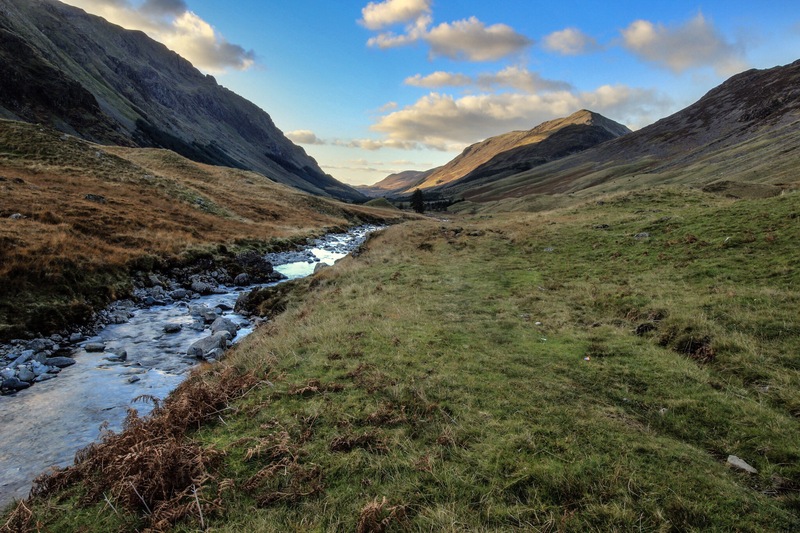 A walk along the Ennerdale Valley to Great Gable. I set off at 7am from a footpath just beyond Croasdale, a gentle climb leads up through a maze of stone walls alongside Gill Beck, Borne looms in front. It’s a dull overcast morning with a cold easterly wind rushing down the side valley between Bana Fell and Great Borne. The hope is to reach the top before 8am and catch the sun rising behind the Gable Group in the East, the weather looks poor for this though. From here I will hike along the High Stile range to Great Gable then return along the bottom of the Ennerdale valley. I reach the top of Great Borne, breathing heavily from the steep climb. I turn round to see a buzzard (Buteo buteo) hovering just behind me. The bird catches my eye, and startled, it plummets swiftly down into the valley. As I trudge towards the cairn the cloud starts breaking and the sun glimmers through; quickly setting my tripod and camera up I manage to grab a shot of the rising sun. From Great Borne, my walk continues along the High Stile range, the grassy tops are barren and desolate and, with the cold wind whipping across them, feel unwelcoming. As I walk over Starling Dodd the cloud breaks further and the wind begins to die, and by the time I reach Red Pike I’m wearing a T-Shirt and sunglasses. I stop on Red Pike to photograph the rising sun again as well as a shot of the fells behind Buttermere. Red Pike sits about two thirds of the way down the High Stile range, well into the fells. 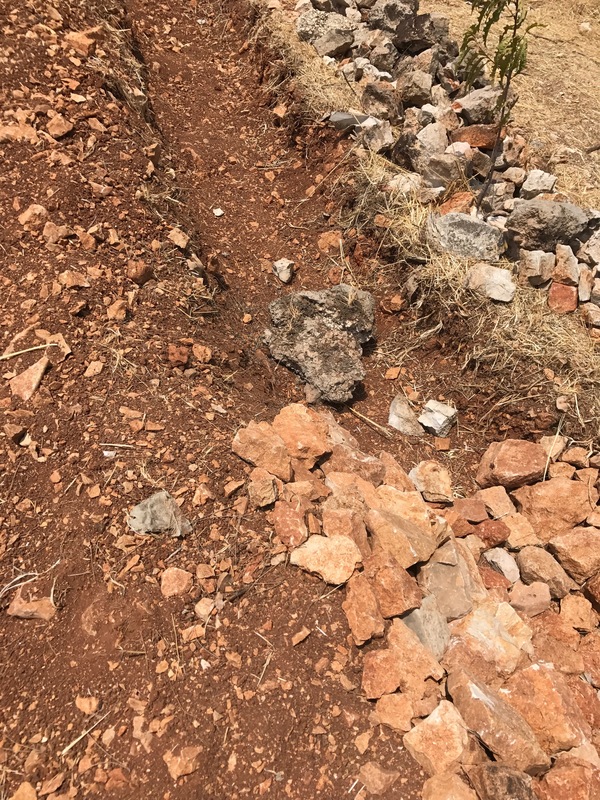 Now, up at 750m, the terrain has begun to change; the stiff grass is littered with large granite boulders, as though an asteroid storm just rained down. The ground becomes drier, firmer underfoot and the ratio of moss to grass in the ground-covering vegetation decreases. Though the environment has became ecologically harsher, it feels more inviting than the barren grass tops of the morning. The granite cliffs can be seen rising in the distance, illuminated by the sun; a sign of whats ahead warranting further exploration. 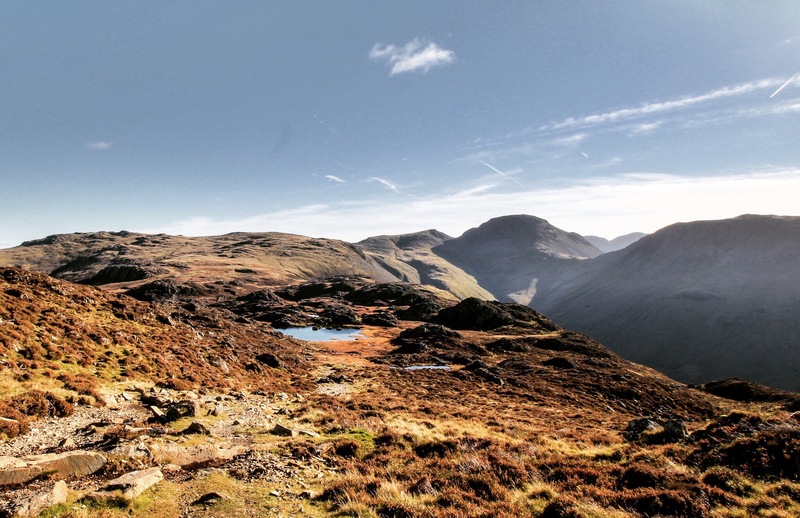 From Red Pike, a short climb leads to High Stile, the fell from which the range takes its name and, of course, the tallest, at 807m. A raven (Corvus corax) soars around the cliff edge; I look for its mate but can only see the one. Ravens are often seen in pairs because they tend to mate for life and patrol a chosen territory. I see them often when I hike in the fells and enjoy watching them floating around the cliff tops — it’s seems to require them impossibly little effort to stay airborne. I continue down to High Crag to take my next photograph, a shot with Great Gable framed in the distance. Descending onto Seat sees the end of the High Stile range and the first person of the day. Hiking up into Scarth Gap from Buttermere is a popular way to access Haystacks, you will always meet someone on this hike. Scarth Gap also sees the divide between the High Stile range and the Gable Group, a break in the mountains to a low of 445m. The gap is steep sided and rocky requiring a short technical scramble to cross onto Haystacks. Halfway up onto Haystacks I stop on a rocky outcrop, a perfect view point for a picture up the Buttermere valley. At the top of Haystacks, I encounter more groups of people – this is likely to be the busiest place on the walk. 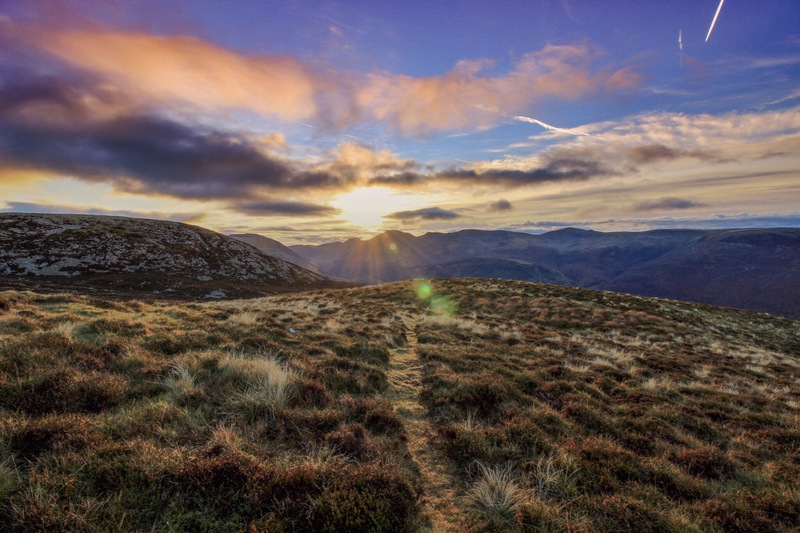 It’s described by Alfred Wainwright as his favourite summit, “for beauty, variety and interesting detail, for sheer fascination and unique individuality, the summit area of Haystacks is supreme. This is in fact the best fell-top of all.” The legendary guidebook author’s testament has made Haystacks forever a popular summit. Standing at the summit I take a picture of the most beautiful fell top of all, so you can see if you agree. Walking down from Haystacks main peak along the ridge, towards the lower South East Top, is a lovely scene. 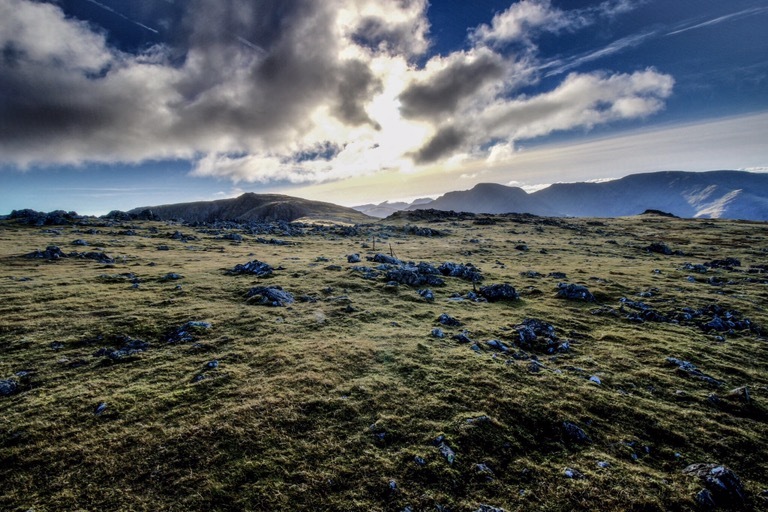 Rocky outcrops pierce the marshy ground, coated in lush blankets of moss. The lower elevation brings wetter ground littered with small ponds and tarns. They reflect the sun and from a distance shimmer like pearls on the landscape. Sadly, I must depart the tranquil landscape and walk onto Brandreth. Brandreth is a smooth grassy lump with a shallow incline rising from Haystacks toward Green Gable. For me, the mountain lacks character — I find myself calling it Blandreth instead. The endless expanse of grass is a disappointment after the craggs, knolls and pools of Haystacks. 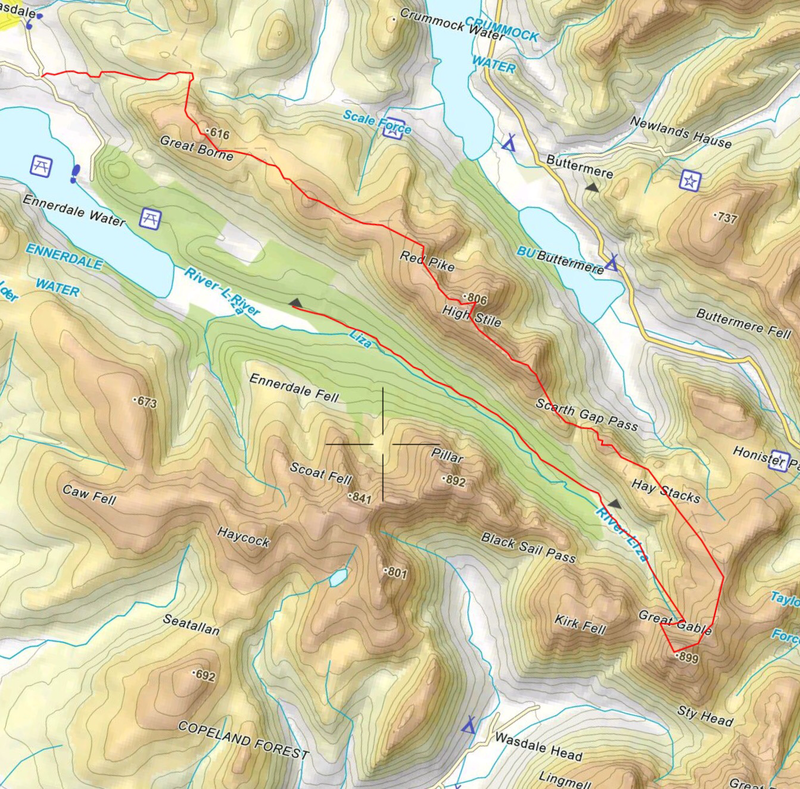 I traverse the area as swiftly as possible, then have a late dinner at the foot of Green Gable. The path up Green Gable is a straight up slog, best performed quickly with a stop half way for a drink. Green Gable is 801m, a significant peak in the Lakes, but always looks tiny on the flank of its big brother Great Gable. The sun beats down intensely now but the air is still fresh and cool; it’s hard to believe it’s the 1st of November. I don’t stay long on the top. I descend the scree path at the south east end of the peak into Windy Gap. 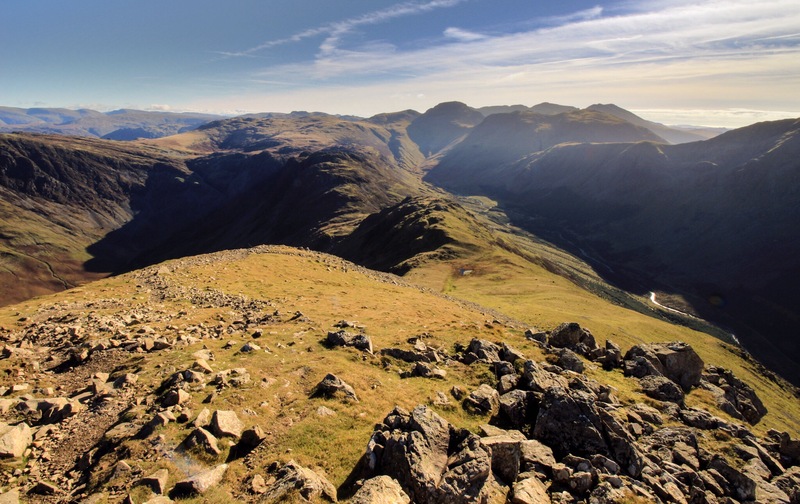 The steep sided gap is a clear divide between the two fells and is often hiked up to from Styhead tarn in the East as a route onto Great Gable. 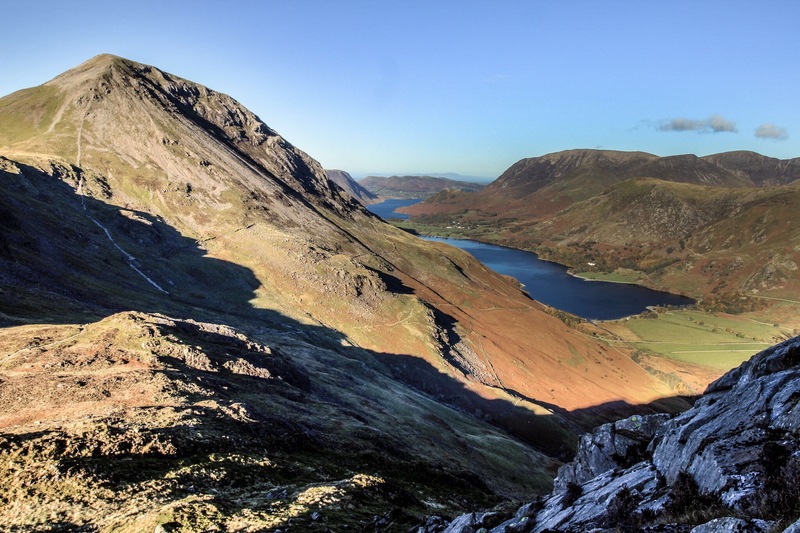 The gap also provides a tremendous view back down the Ennerdale valley towards Haystacks and the High Stile range. I’m tired now but only one last climb remains: the assent from windy gap onto Great Gable. A steep climb up rocks cut by years of footfall sees me quickly to my final destination. The summit always makes me catch my breath, or is that the climb? The summit area is massive to behold, a vast plateau, around half a mile across, covered with boulders, craggs and cliffs. Small patches of vegetation cling desperately to life among the rocks, only to be grazed by a sheep looking for an exotic meal at 899m. 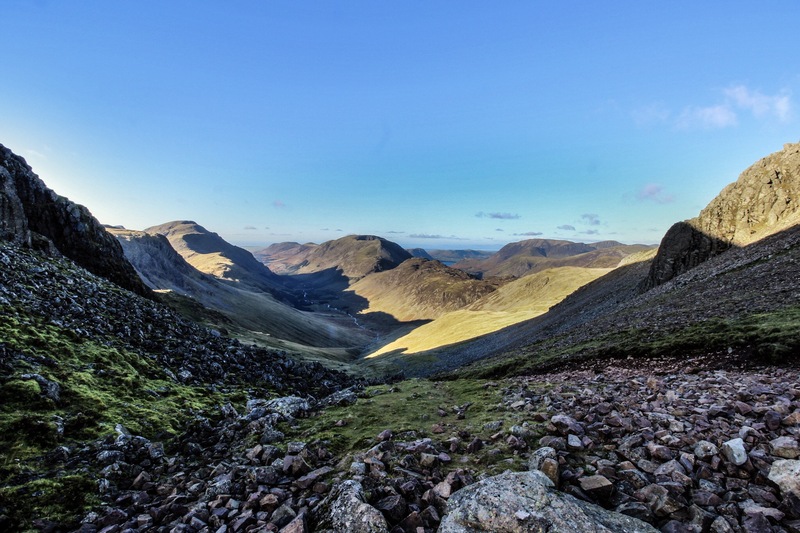 Great Gable is a popular fell, one of the largest in the Lake District, and a relatively difficult assent (unlike Scafell Pike or Skiddaw). 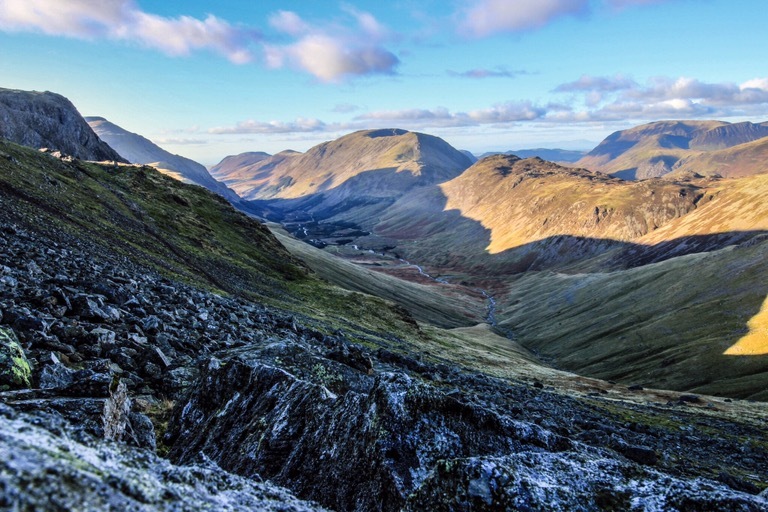 It has a prestige associated with its name; Wainwright muses “the name appeals magically. It is a good name for a mountain, strong, challenging, compelling, starkly descriptive, suggesting the pyramid associated with the mountain from early childhood.” My photographs fail to show this pyramid shape because is only occurs when the mountain is viewed from Wasdale valley to the South West. 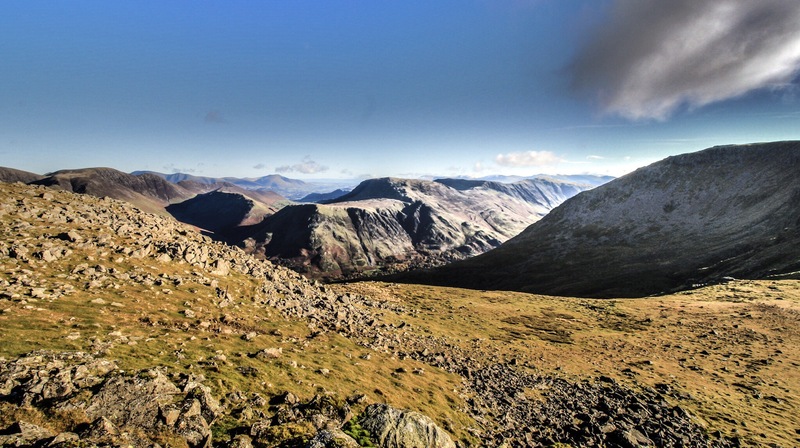 Great Gable is held in such high regard among fell walkers and climbers that at the top stands a memorial plaque commemorating members of the Fell and Rock Climbing Club who died in WW1. In 2013, the 70kg plaque was carried down the mountain on a stretcher by thirteen soldiers to be replaced because it contained spelling mistakes. The replacement was installed later in the year by royal engineers. Every year on Remembrance Sunday over a hundred people gather on the summit for a remembrance service. I depart from Great Gable down towards Beck Head having enjoyed the terrific views the lone summit offers. The decent is steep and hard on my tired legs — it’s been some time since I’ve hiked and the distance has take its toll. Evening is rolling in quickly now, the sun has begun dropping towards Pillar Group on the south western side of the Ennerdale valley. The air is cool and fresh and the light has become soft and forgiving. I stop in Stone Cove, a recess at the valley head formed between Green and Great Gable. Here I rest, drink, and take a few photos down the Ennerdale valley making the most of the good light. Leaving the rocky terrain, I walk a grass and dirt path along Tounge, a spit of land jutting from the base of Windy Gap into the valley. My breath becomes visible as the air cools further, and the bronze hue of the fading bracken is amplified in the red tones of evening light. The landscape has begun to soften, ready for night to engulf it. At the base of Tounge, I stop, and take one last exposure out of the valley towards the coast. I then briskly walk the last 5km to the car before the light dies. Having spent the last year working in East Sussex, it’s been nice to come home and spend a few weeks in the Lake District before leaving for Jerusalem. Sussex is a brilliant landscape; I was living in the Weald, an AONB (Area of outstanding Natural Beauty) and one of the most densely forested areas in England today. The rolling hills covered with mixed deciduous woodlands of mostly Fraxinus excelsior, Quercus robur, Corylus avellana and the less welcome Acer psuedoplatanus, create a tranquil setting. But no landscape in England can match the Lakes for me. It’s probably because I grew up there, but when I live where it’s flat I always yearn to see the mountains. The sight of them rising in the distance adds such drama to the scene. All this to say, it’s good to be home and yet, I can’t wait to get to Israel. I hate packing, I always forget something. It’s never something insignificant either, it’s always an essential. So here I sit, like old santa checking his list, laying out my essentials in font of me. For 8 months I seem to have surprisingly little which is good, the more space I have the more books I can take with me. In all honesty that’s the hardest part of this packing is choosing which books to take. Apparently English books can be expensive in Israel so I’m keen to take as many as I can! I’ve never been to the Middle East before so for me this is going to be all new. That’s what excites me most — as much as I love revisiting places or going to culturally or climatically similar places, totally new is the best. No amount of preparation can actually prepare you, you just have to go with it and embrace the place. New places are the ones you remember the best. There will be things I’m familiar with, especially in terms of plants: Colchicums, Cyclamens, Verbascums, Irises, Alceas are just a few of the cultivated plants that wild species of can be found in Israel. But there will be many more that I have never encountered. I’m also excited for the architecture, especially in Jerusalem. 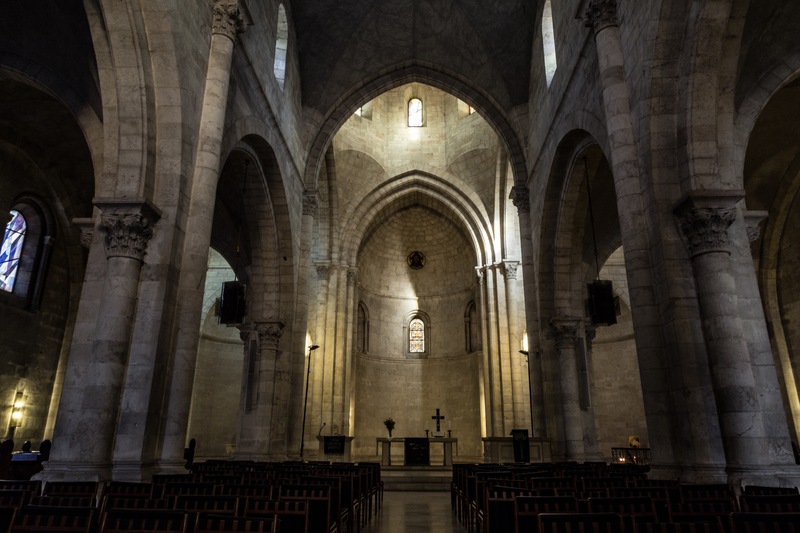 England has incredible Cathedrals and Castles which are often many hundreds of years old, but the age of many of the building in Israel is in the thousands of years — it’s absolutely mind blowing. 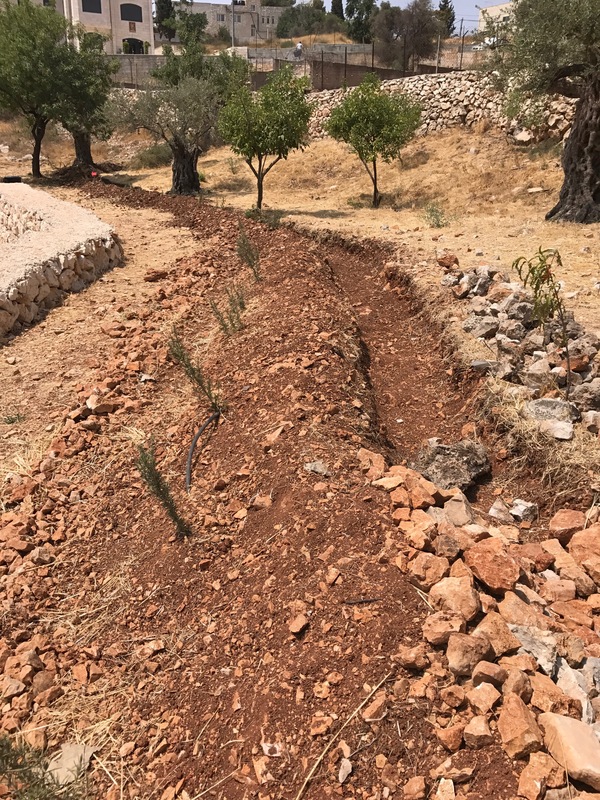 In Jerusalem, I will be spending 8 months working as a propagation intern in the Jerusalem Botanical Garden. Working with plants in their natural habitat should lead me to better understand how to grow them well — I find plants that I associate with a place are easier to remember. 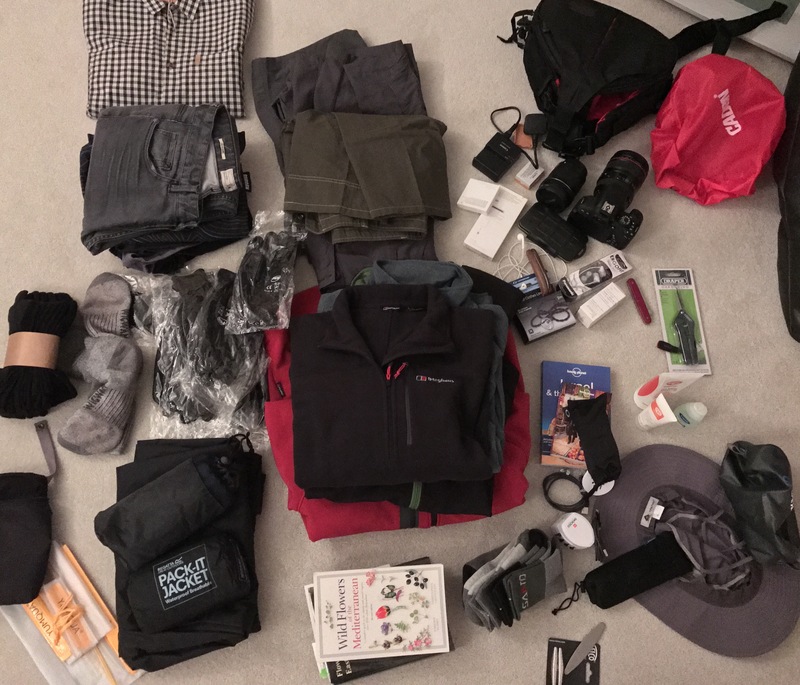 With this blog I hope to share with you both the plants I see and work with and the places I visit. I will also post regular photos on my Instagram (Link on top of page) from my trip. My next post will hopefully come from Israel; I’m waiting on my Visa but should be flying out soon!